Capturing visual information on your computer screen is a great way to preserve content that may eventually change or expire—like a breaking news story or a time-sensitive list. You can use OneNote to take a screen clipping of any part of your computer screen and add it as a picture in your notes. Bring into view the information that you want to capture (for example, a web page or another application). 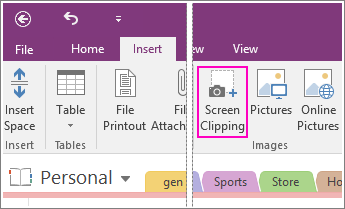 Switch to OneNote, and place the cursor where you want to add the screen clipping. Choose Insert > Screen Clipping. OneNote minimizes and you are returned to a dimmed version of the last thing you looked at. Use your mouse or finger to select the area of the screen you want to capture. After you make your selection, it will appear as an image in your notes. It will also be copied to the Windows Clipboard so you can paste (Ctrl+V) the screen clipping on another page in your notebook or into another app. Note: Screen clippings are static images that represent a snapshot of information. If the source of the information is updated, the screen clipping remains the same. There’s no link between a screen clipping and its original source. You can, however, copy text from pictures in OneNote and paste them as editable text. If you prefer using keyboard shortcuts, press Alt+N+R to start your screen clipping. If you're used to clicking the OneNote icon in the Windows system tray, you might notice that it's not visible in Windows 10. Here's how to get it to appear. In the lower-left corner of the screen, click the Windows icon, and then click Settings. In the Windows Settings window, search for Select which icons appear on the taskbar. Beside the Send to OneNote Tool, change the toggle to On. After the Send to OneNote tool is in the system tray, you can begin to use it. To change what the icon does right-click it, point to OneNote icon defaults, and choose New quick note, Open OneNote, or Take screen clipping. Note: If you click the icon, you will see the Select the OneNote Location dialog. However, the keyboard shortcut you see (Windows+Shift+S) has been changed with the Windows 10 Creators Update. Using that shortcut, your screen clipping will go immediately to your clipboard so you can paste it into any application, including OneNote.